Oops! Here it is, past dinner time already and I haven't posted this week. Well.. I think I'll let myself off the hook just this one time. Spent the day visiting friends and just enjoying the gorgeous Yarra Valley. 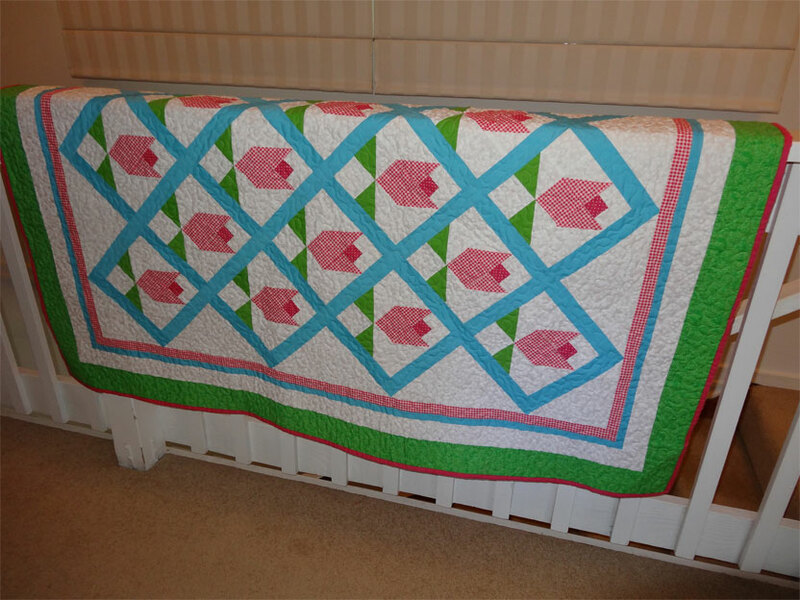 I had planned to do a "year in review" post here, and put up a string of all the photos of quilts completed this year - maybe I'll do that next week. In the meantime - a very HAPPY NEW YEAR to all of you! 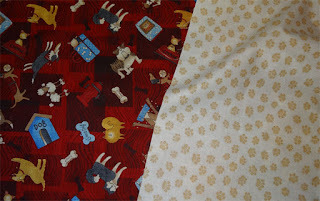 Quilt 51: Doggoned Placemats (super fast and fun project!) - DONE! Aunt Sheila lives up in Ballina, NSW, with Ben, her dacshund ("Cousin Ben"). 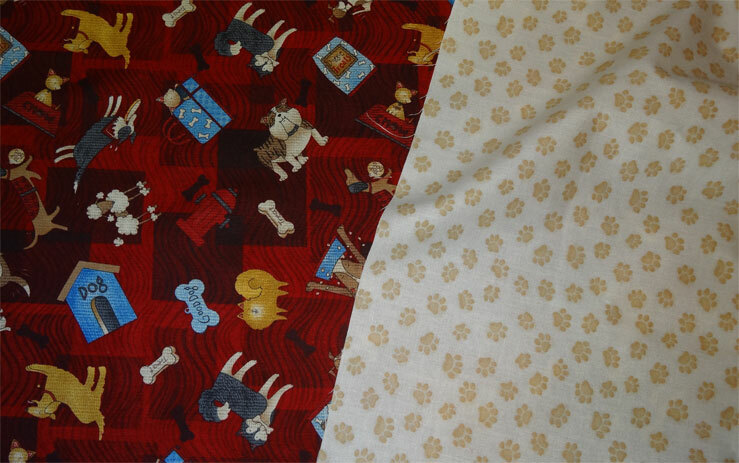 She's the kind of person who can be tough to shop for at Christmas, but this year I came up with an idea: placemats with a dog theme! 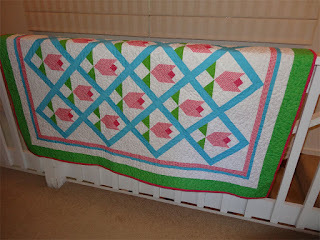 It was a fun project and I'm delighted with the results. 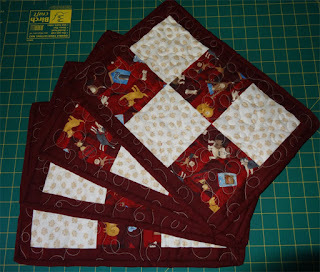 I bought 2 "fat quarters" (below) and 1.5 meters of solid maroon for the borders, backing, binding. 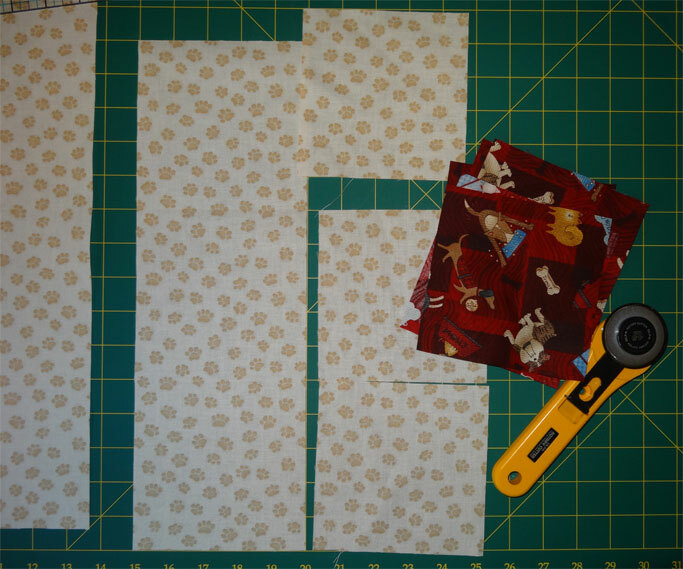 I cut the fat quarters down into 5" squares, using 3 squares of each print. I opted for a narrow border, stitched the whole thing into a single panel (below), with double the border between the placemat blocks. 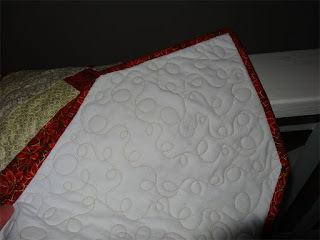 I opted to use gold thread for the quilting. 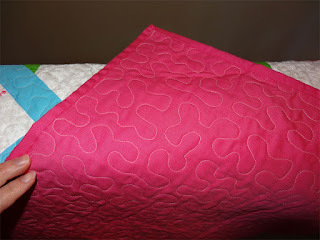 After quilting, I just cut the mats apart - super fast and easy! And here they are - all done! And hey! The back even looks pretty good! The gold thread looks great on the solid maroon. 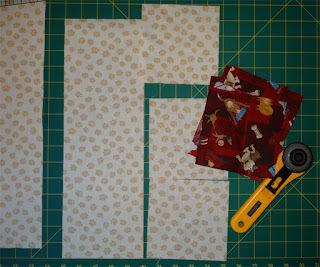 I'll definitely make more placemats in future - although I'll cut 4.5" blocks, as the overall size of the mats as shown here is about 14" x 11, which is a little larger than they really need to be. The leader of my "Tuesday Group" was involved with a fundraiser for a good cause. 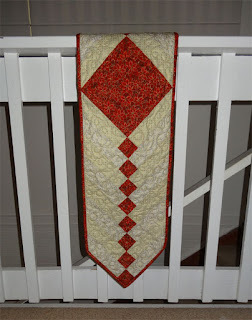 I decided to help out by donating a couple of Christmas table runners for them to use in their raffle. Jacquie, one of the members of the group saw them and asked me if I'd whip one up for her. SURE! 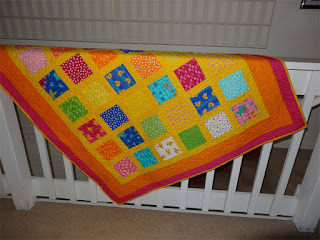 I'm always on the lookout for "quilt victims". The bold poinsettia print is strong enough to carry the Christmas theme, thankfully! 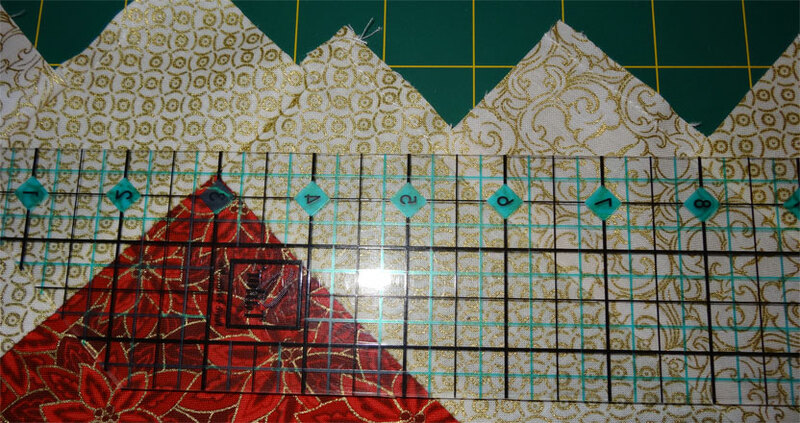 When I made the previous three runners, I made an error when cropping the edges. 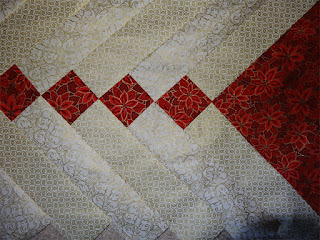 I cropped right up to the point on the center block - WRONG!!!! 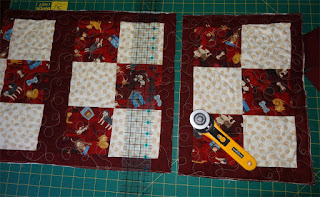 That flattened out the point when I put the binding on. 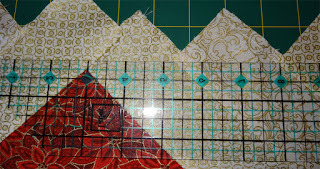 This time I was smarter - keeping that cropping 1/4 inch from the end of the point. 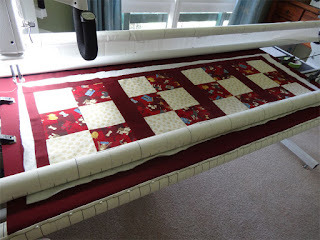 Jackie asked me if I could make the runner about 1.5 meters in length. SURE! But, you know what?!?!... 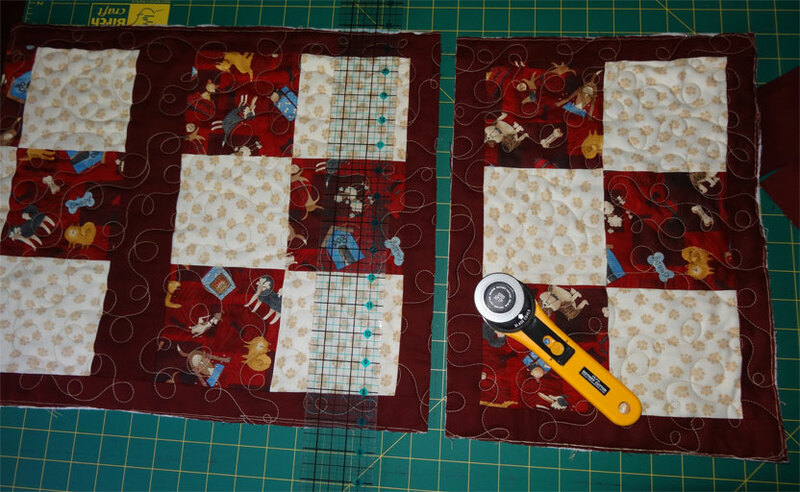 I was using a 9" center square and 2.5" wide strips - and after I got out to the end, realized I'd have to go slightly under or slightly over. Jackie chose "under" so it wouldn't come to close to the edge of her dining room table. Here it is on the longarm, ready for quilting. 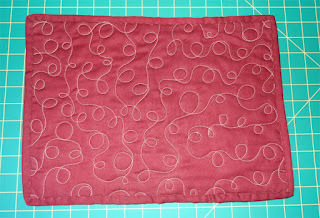 Finished dimensions: 12" x 57"
And here's the back, where you can see the thread and my design. I'm still not completely confident with my freemotion swirlies - but I'm getting better at it and have to admit that quilting the swirlies is SUPER FAST. Maybe I'll get bold and do this pattern on one of my "Inspirational Quilts" projects. 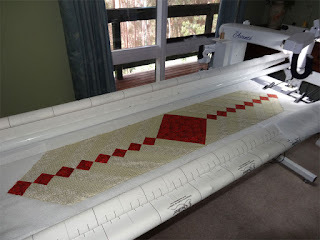 So Jackie's got her Christmas table runner, and I had a ball putting it together for her. In October I whipped up a quilt using charm squares ("Splish Splash" by Moda). 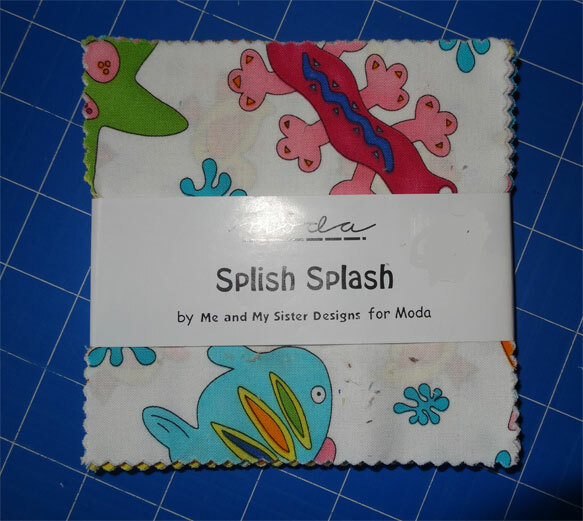 I had enough left over to do a second one with the same design. 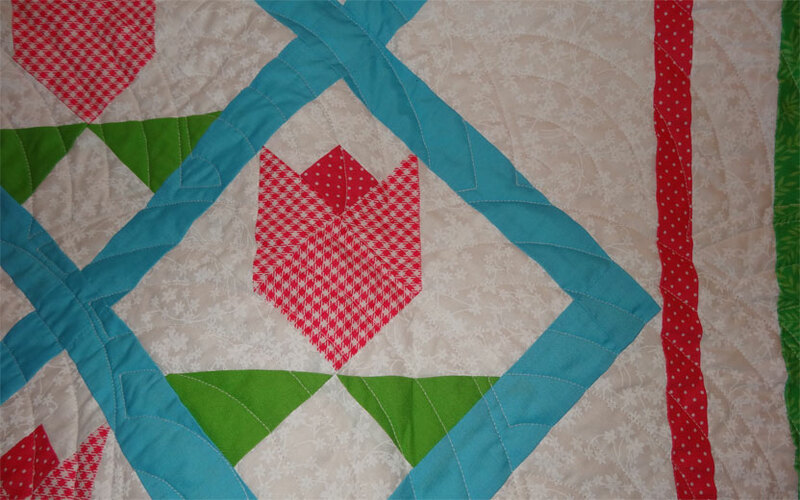 I quilted the first one with "Baptist Fan" as the design - but opted to do this one using "Simply Stipple" instead and yes... even as I found with the Tulip Garden design (last week's post), the stippling really looks much better. than the "fan". And here's the backing (solid orange). 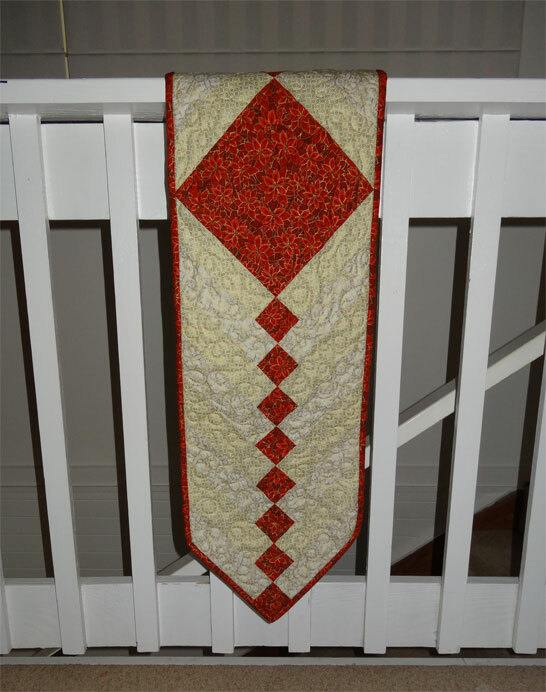 And there you have it - another quilt for "Inspirational Quilts"! 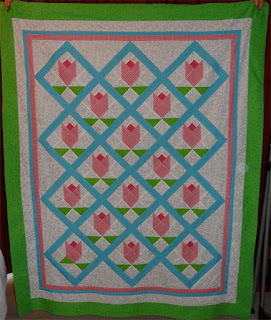 Quilt 48: Tulip Garden II - DONE! 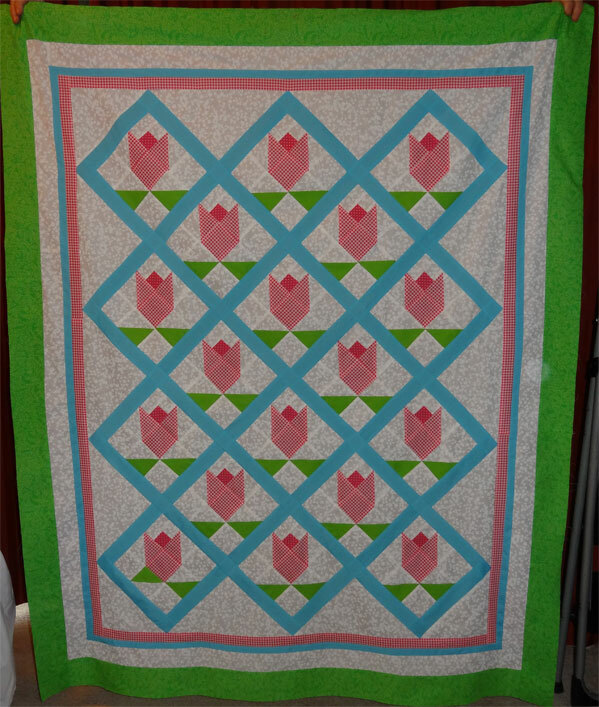 A couple of weeks ago, I posted about my "Tulip" quilt. After finishing the quilt, I looked at the scraps and realized that I just about had enough leftover from that quilt and other projects to do a second one, so sure! Why not?!?! I finished the binding last night. 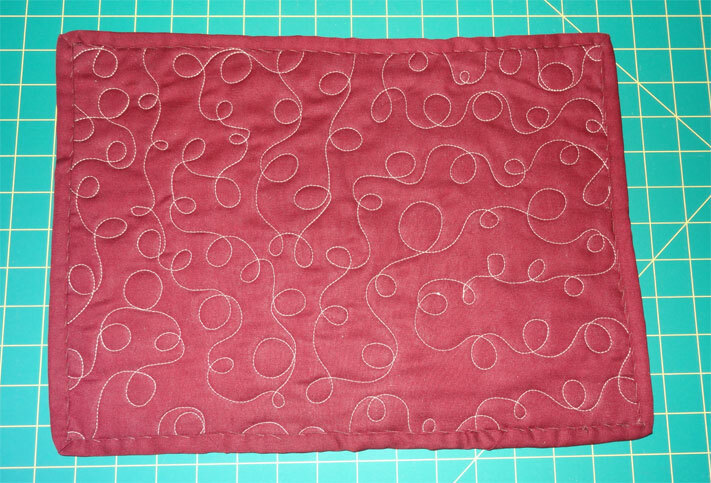 I didn't have enough green for the binding (as I did on the first one), so opted to bind it with the bright pink I used for the backing. I'm loving my Handi Quilter groovy boards, and when I did the first tulip quilt, I used the "Baptist Fan" boards, which I thought at the time would be the best choice. Here (below) is what that design looks like on that first quilt. Well - that's interesting. I originally thought the stippling would overwhelm the quilt, but it doesn't, does it? 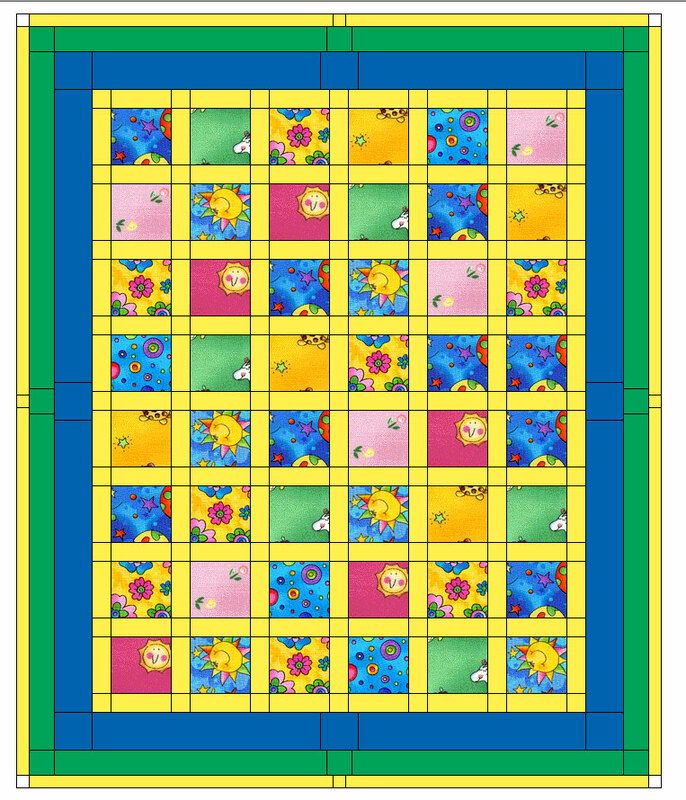 Actually, I think it's a MUCH better stitch design for this quilt. So there you are! 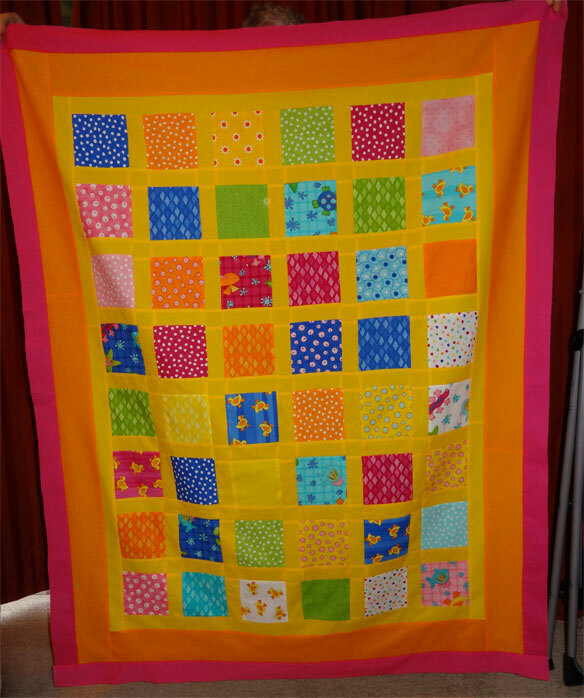 Another quilt done! 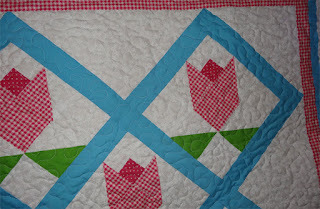 And, just like the original "Tulip" quilt, this one is going to "Inspirational Quilts".